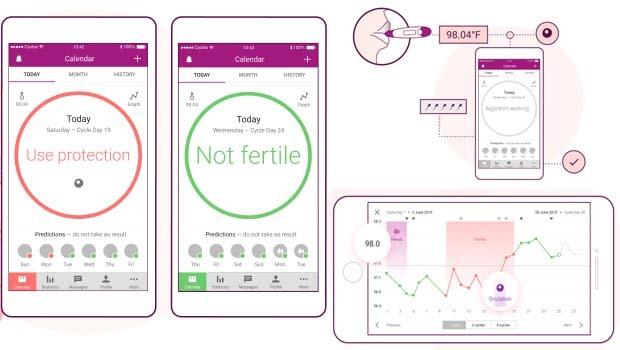 Natural Cycles Fertility App – About “greener” fertility alternatives to pills for birth control or for fertility planning. A digital app for natural planning birth control that can be as or more effective than traditional methods. Interview with the co-founder of the app, Dr Elina Berglund, along with Dr Acuna, Chair of the Department of Medical Health and Sciences Research at Florida International University. Lisa LaGrou Oakland County Moms – What is Natural Cycles, and how does it work? What makes it different than the Catholic’s natural Family Planning method? Natural Cycles Fertility App Co Founder Dr Elina Berglund – Of course, Natural Cycles is a birth control app and it’s the first of its kind. It offers women an effective, non-hormonal solution and it’s cleared by the FDA. It works with an algorithm behind the app that analyzes women’s body temperature to determine when they’re fertile, and not. So, if they are fertile or risk of fertility is there, the woman gets red day and she uses protection if she wants to avoid pregnancy. If there’s no risk of fertility, she gets a green day and she does not need to use protection. It’s quite different from the Catholic Natural Family Planning method thanks to the algorithm. Analyses of the data can very accurately pinpoint a relation and fertility. That makes the effectiveness and ease of use much higher. So, it takes the traditional, natural contraceptive methods and brings it to much higher effectiveness level and makes it much more easy to use as well. Lisa LaGrou Oakland County Moms – I understand that “FemTech” is a booming market. Can you explain what it is and where you see it heading? Natural Cycles Fertility App Co Founder Dr Elina Berglund – “FemTech” and women’s health in general I think is a very exciting field where innovation is needed and our mission is to pioneer women’s health with research and passion. We want to drive innovation within this space. Natural Cycles is the first app to be cleared as a birth control as this sets a very big milestone within this space. But, I think there’s much more innovation yet to come. Lisa LaGrou Oakland County Moms – Is there a need for natural methods of contraception? Who is Natural Cycles for? Dr Acuna – Absolutely. In the past, as you’ve pointed out, there’s been a link to religion or other factors. But, now, it’s well known that about three million women use this type of method just in the US alone. So, some women are making more “greener” choices for themselves. They don’t want to use hormones or they don’t want to use devices implanted in their body. The problem was that natural forms of contraception were not very effective. With the app and the complexity of its algorithm, this is really a break-through in natural contraception. So, for all these women that do not want to use all the other hormonal methods, this comes as a highly effective method of contraception and a very good alternative. Lisa LaGrou Oakland County Moms – How effective is Natural Cycles compared to other methods of contraception? And, if it’s not 100% effective, what contributes to that? Dr. Acuna – There are no methods of contraception that are 100% effective. All of the methods will have a percentage where they will not work for some women. The smaller the percentage, the more effective. Natural Cycles is at 93%, which is where the effective methods are. Within the classification of NC effectiveness is, just to understand, within the same tier of 93% proven by studies of injectables and the pill which are widely used and very well known. So, it’s an effective method of contraception. Lisa LaGrou Oakland County Moms – Do you find that women know enough about their fertility and their options for natural methods? Can an app like Natural Cycles help? Dr. Acuna – Unfortunately, they don’t. Not only in my clinical practice for 30 years but supported by population-based research findings, women do not know enough and they should know more and they could know more. So, Natural Cycles through the app is actually doing two things…first, is providing this break-through in natural contraception that is effective and now they can use, and second, it helps women know more about how their body functions. It empowers them to make better and more informed decisions in their reproductive life. Lisa LaGrou Oakland County Moms – So, Natural Cycles can also be used to help women get pregnant? Natural Cycles Fertility App Co Founder Dr Elina Berglund – Yes, that’s a big benefit for a birth control method like Natural Cycles. You can use it to both plan a pregnancy and prevent a pregnancy. Lisa LaGrou Oakland County Moms – Dr. Berglund Where can we go for more information regarding this app? Natural Cycles Fertility App Co Founder Dr Elina Berglund – You can visit us on NaturalCycles.com to read all about it. You can also go directly to the app store and download the app. It’s of course always important to talk to your doctor about what birth control method is most suitable for you.